While our broker is located inside the home network does not threaten us that someone is not authorized subscribe, or publish something in our topics, but when the server will be available outside the network we need some secure. It would not be good if someone would not be allowed to control the light in our house, or worse, open the door. 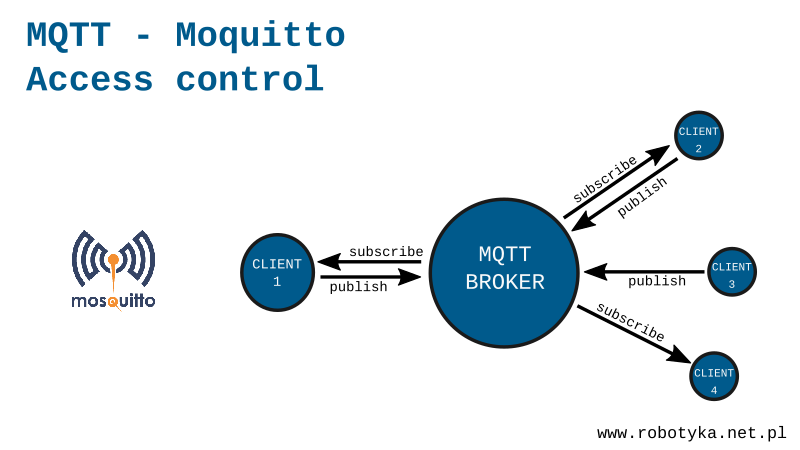 The Mosquitto broker has a security system, where without the appropriate login and password to connect with it. Save the file (Ctrl + O) and close the editor (CTRL + X). The first line prohibits connecting to anonymous users, and the other determines in what file will be the user’s logins and passwords. “hasło” means password in polish. Password encryption is very useful, now that someone will have access to our computer and see the file password_m it does not know anything beyond the login, because the unencrypted form of the password is only in our biological memory (brain). The anonymous user will no longer be able to connect to such a prepared broker. Now every time we call the mosquitto_sub and mosquitto_pub commands we need to give our login and password. This is used for the arguments -u login, and -P password. mosquitto_pub -u pawel-P haslo -t myTopic -m "Message"
1532967289: Socket error on client <unknown>,</unknown> disconnecting. Thanks to this we know that someone anonymously tried to log in but bounced off our defensive wall. After doing this, we can safely share our broker for the external network without fear that someone will be able to hack into our home control system. Without the right data, nothing will be done. This entry was posted in IoT (Internet of Things), Tutorials and tagged IoT, linux, mosquitto, mqtt. Bookmark the permalink.